In a recent Herald Times article regarding the former home of Hoagy Carmichael on 536 S Washington, there seemed to still be some question regarding whether the home (recently suffering a bad fire) was indeed Mr. Carmichael’s 1925 home. This side-by-side 2013/1925 combo photo should put any questions to rest. The back of the old photo says “Washington Street, Bloomington house where Stardust was born first.” Brad Cook at IU Archives believes the handwriting is Hoagy’s or his sister’s. Nancy Hiestand of the City of Bloomington confirmed that Mr. Carmichael does show up in 1920s directories living at this address. The idea that the song “Stardust” was composed from start to finish at either 536 S Washington, the Gables/Book Nook (now Buffalouies) or Keuka Hotel in NY is unlikely. Often, musicians work on songs a piece at a time, over a period of time; so, it is much more likely that Hoagy started to compose the song as 536 S Washington (where it was “born” as the family photo contends), further worked out at the Book Nook/Gables, and then finalized in NY before the recording session in Richmond, IN. As historian Carrol Krause points out: Hoagy himself wrote in his autobiography that it took him about 3 years to complete the song. 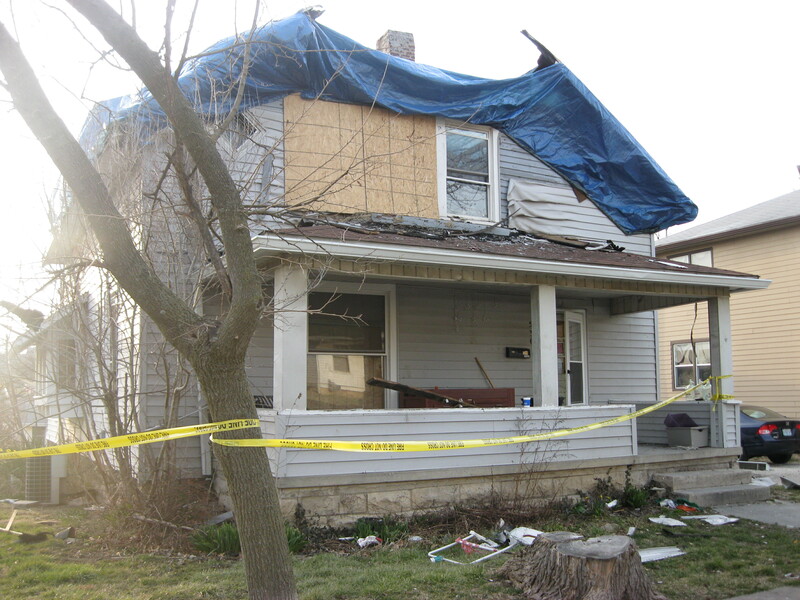 The 536 S Washington property looks to have sustained a lot of damage in the fire and the insurance company may recommend the razing of the historic home. Having had the opportunity to communicate with the owner of the home (Eric Terhorst), I can clarify that his comment in the Herald Times of being a “cold-hearted investment banker” was very much tongue-in-cheek; he explained: “…you had to hear the tone and context.” He is a musician and has an appreciation for Hoagy Carmichael’s legacy. 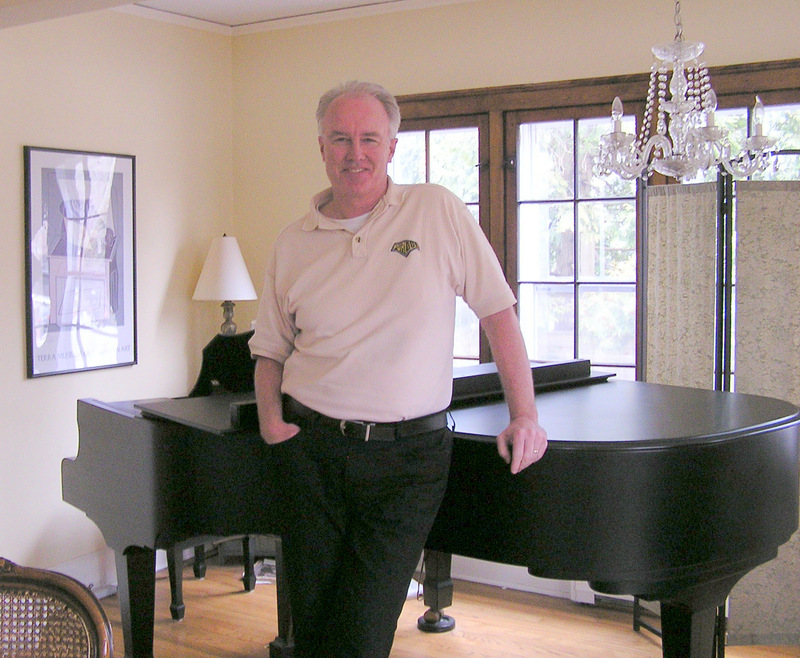 Mr. Terhorst, owner of the house at 536 S. Washington, pictured here with one of his beloved family members, an Estonia piano. Either way, we should know rather soon what the fate of this home is. Meanwhile, Mr. Terhorst raised a good question during our communication: where do songs live? As a “former” musician (one never really retires from being a musician), its a question I can relate to–and a particularly good question for someone (me) who named a whole album after the address where the songs were “born” (2002’s “943 Recluse” was written at 943 N Jackson). Based on what we know (or don’t know) about the writing of “Stardust,” it seems to me that saying so would be a bit of a stretch. D&J: Great to see the confirming pics! Good to see this on BF, since many people don’t see the H-T and so missed their article on the Hoagy Carmichael House. Hoagy’s memoir “Sometimes I Wonder” is a must-read, a really engaging memoir (I’d be glad to loan my copy to you). In it he remembered coming back to town as a post-grad, having completed law school but having chosen to tour with friends’ jazz combos for a time. Back in Bloomington in the mid-1920s, he sat alone on the “spooners’ wall” along Third Street one evening, thinking back on his two girlfriends from his high school and college days. The beginning of a tune came to him, and he raced over to the Book Nook to borrow the piano there. Pete was closing up but let Hoagy stay and play for a little bit. Hoagy noted in his memoir that he worked on the song for three more years before it was recorded. He bounced around quite a bit in terms of a personal address, sometimes living with his parents, other times living with friends in rentals or crashing with his frat buddies. Is there any proof from the 1920s phone directories that he lived at this house? I would not be persuaded that any handwriting is Hoagy’s or his sister’s without a firm ID based on his other family papers preserved at IU. I find the whole thing rather doubtful. Yes, phone directories also have him listed as living at this house. I’ll also email you the HT article on this where Nancy Hiestand confirms this. Carrol: No one is contending that just because he lived there that this is where the song was written. I don’t draw that connection. 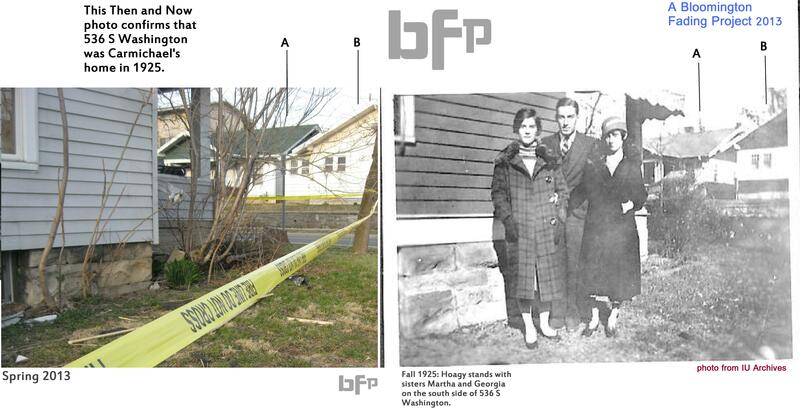 The question that the HT raises is whether the house in the photo is actually the same house that stands there today or whether the house in the old photo was really 536 S Washington–which the side by side confirms. The question regarding WHERE the photo was taken is no longer a question.The blog points out that the song Stardust was written over a period of time, in a myriad of different venues.